A striking six storey block of flats is the latest addition to Ayr’s skyline. It is part of Ayrshire Housing’s latest affordable housing development. 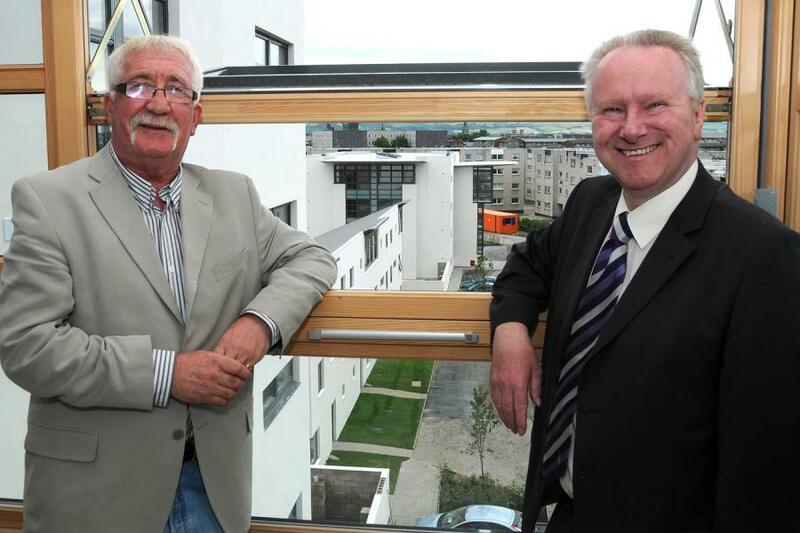 The 44 house project was officially opened 8th July 2009 by Scotland’s housing minister, Alex Neil. After meeting a delighted Alison Keating in her new sixth floor home, he said “the Scottish Government is investing record amounts of funding in boosting Scotland’s stock of good quality affordable homes”. “Over the next three years we are investing £1.5 billion and this year £23 million will directly support the affordable housing sector in Ayrshire. With its mix of flats, many with lift access, and town houses, the £5m project has been carefully designed to cater for a wide range of household requirements. A product of the longstanding partnership between Ayrshire Housing and South Ayrshire Council, it contributes to the regeneration of the Wallacetown neighbourhood. It has been made possible by a Scottish Government grant of £3.8m. It has been built by Prestwick based Ashleigh (Scotland) Ltd who sourced much of buildings’ structure from Ayrshire manufacturers. The striking design is by Roan Rutherford of Austin-Smith:Lord.